If I wasn't almost positive that we would burn the house down trying, I would give these fun Won Ton Roses a shot for Mother's Day. The last time I tried to deep fry something (also known as the first time) I bought a new thermometer and a few other frying essentials and had broken the new thermometer within 2 minutes of starting. Hot oil and I do not get along. But if you are more talented with a fryer than I am (my mom is brilliant with it and I wish I had inherited those genes), then these fun treats would be a neat lunchtime appetizer for mom. 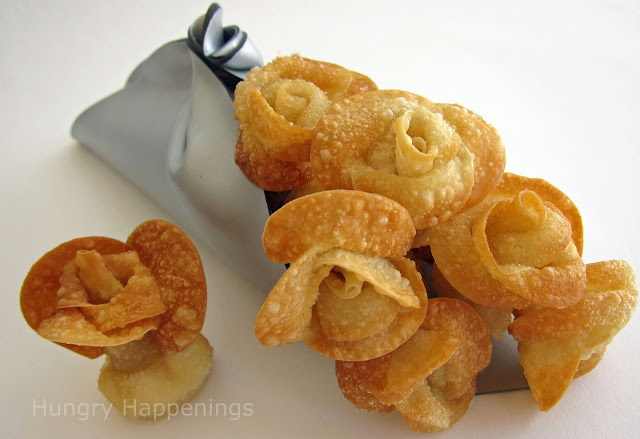 You can see how to make these won ton roses over at Hungry Happenings. I'm so happy you featured my won ton roses. They are one of my favorite creations. I hope your readers like them too!